Luaria is the dark side of Saylua. In contrast to Sayleus, Luaria is always night. The people of Luaria are called Luarians. Compared to Sayleus, Luaria has a significantly lower population. Luaria is also much colder and darker than Sayleus, causing the region to be more difficult for humans to inhabit. However, humans who live on Luaria pride their extremely close connection with magic and nature. While Saylians tend to live a more fast-paced life focused on the gathering of knowledge and the progression of technology, Luarians require significant connection with pets and magic simply to survive. Luaria's geography was forever transformed by the impact, which brought devastation but also a source of hope. Today, humans and animals alike depend on plants that absorb magical energy from the auroras. Even with this blessing, life is very difficult amid the constant darkness and cold. Families stick together for the most part, and in many villages you can find four generations living under the same roof. Tucked away in valleys and clearings, these villages provide a refuge that can feel cut off from the outside world, although trade and travel between villages is not uncommon. A Luarian village in many ways acts as a nation unto itself, with its own shifting politics between and within the large families. Outsiders can expect a warm welcome but one that some have described as superficial or untrusting. The truth is many Luarians remain skeptical of outsiders until they have proven themselves over a period of time and become part of the community. Since death is a daily reality in the frozen countryside, many Luarians have adopted a somewhat cavalier outlook. Taking risks is essential to survive, and the casual manner in which Luarians conduct themselves in the face of danger can be unnerving to those not accustomed to it. Luarian folklore is filled with great songs and tales of heroism, and children are taught to emulate the heroes of the past, in so being remembered by future generations. Interestingly enough, some interpret infamy as an equally acceptable path to cultural immortality, so long as one is not hated completely. Hunting and trapping from a young age, Luarians train in magic continuously leading to an almost intuitive magical aptitude. Those who are unwilling to work will find themselves unwelcome in Luarian villages, with those who are especially uncooperative being cast out into the wilderness. The insular nature of Luarian society combined with the stresses faced by communities lead to a legal system that could be described as permissive. Aside from the universal crimes such as theft, Luarian justice focuses on keeping people safe from others in their use of magic, for sparring or otherwise. Harming animals or companions unnecessarily is considered one of the most extreme crimes under Luarian customs, and is usually cause for immediate exile. The border of Luaria is traditionally held to be the place where the sun no longer peeks over the horizon, although this does mean that there is still an afterglow present near the border of The Dawnlands. Many Saylians would say that you haven't truly visited Luaria until you've ventured far enough that the red orange sky is completely replaced by midnight blue. Although the auroras are present all across Saylua, they become more brilliant and concentrated in the area near the meteor site, and they are much more visible against the Luarian sky. As one moves towards the solar equator, the land becomes more forgiving. Glaciers and small islands dot a vast expanse of seawater and chunks of ice glide along the water’s surface. These icebergs are home to many semi-aquatic lifeforms and give rest to those passing over the wide ocean. The aurora’s uninhibited touch here has caused some of the inhabitants to become bioluminescent, often mimicking the ribbons of light above them to camouflage beneath the water’s surface. Eventually, the icy ocean washes up on solid land where plant life begins to take root. Sturdy, thick, needled trees reach up from among the jagged rocks and frozen soil to touch the iridescent sky. Among these sparse trees is the crash site of the meteor. It is settled deep in the ground, magic spilling from the highest point on it, manifesting itself as the grand aurora that blankets much of Luaria’s skies. This area is home to many forms of vegetation that have adapted to absorb energy directly from the Aurora. Mosses cling to stones and leafy plants seem to defy their environment by rooting down into the cold soil. The tall, rocky landscape gives protection from wild animals and the elements, often manifesting in towering cliff sides and intricate, almost gravity defying rock formations. Here, snow falls quite frequently, ensuring everything is blanketed in a glimmering sheet of white. In the areas where the sky begins to lighten, the climate begins to change dramatically. The thick, coniferous forests gradually transition into large swamps. Knobby trees take root in the excess water from the melting ice and snow, providing a humid, warm dome of tree cover. 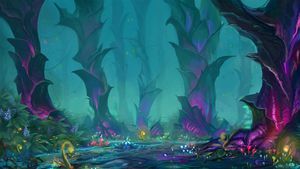 Within the swamp, semi-aquatic plant and animal life thrive, often bioluminescent to brighten their dark home, and mushrooms are a main staple. Many animals have not affected by noticeably affected by the meteor’s magic. Luaria’s native wild animals include rodents such as ermine, rabbits, and mice, birds, and large ungulate animals such as elk, sheep, and moose. The coldest area at the tip of the planet has very few wild animals and is void of plants. Many of the animals that live here are actually microscopic creatures like krill, rotifers, and mites. Beneath the ice, varieties of whales and squids feed and thrive. At the edges of the frozen desert, wild flightless birds pack together and some seals begin to appear, but only where pockets of water are exposed. The very tip of the planet has no recorded life. Ungulates and rabbits primarily exist in the more wooded areas, navigating the jagged landscape with ease. Sea birds nest along the water’s edge in trees and rock crevices. Here, fishing is much more common as cold-water fish are now exposed to hunters from above. In the tundras, rodents like lemmings and ermines find homes under the trees and thick-furred animals like ox and bears begin to appear. The patches of swamp land primarily house insects like mosquitos, dragonflies, and spiders, as well as amphibians like newts, salamanders, and frogs. The shallow water is inhabited by a variety of fish and crustaceans, as well as large alligators, crocodiles, and snakes. Beyond the swamp, deer, caribou, and sheep are common large animals hunted for food and supplies. rodents such as squirrels are more common and many birds, such as owls, loons, and falcons take advantage of the abundant resources. No plants grow in the most extreme regions of frozen wasteland, and those found in the tundra are most commonly thick-trunked trees and short, sturdy grasses. In the richer areas, plants often have elaborate root systems that allow them to dig into the cracks in the frozen ground. Plants become more leafy and abundant closer to the solar equator. Mushrooms are one of the most common Luarian plant-like life, as they thrive in the low light. Other plants include thick-skinned melons and bushes with tiny berries. This page was last modified on 17 December 2017, at 20:23.